Yes, you might remember our experiment with fact ranking [1,2,3,4]. After almost 4 months, this is the current state of intermediate results (cf. below). 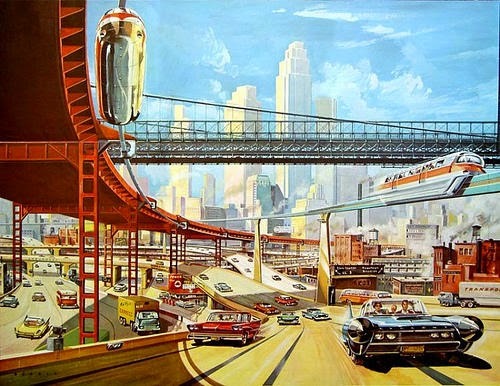 To make it short: YES, there has been some progress. NO, it is not sufficient so far. If you have already started to work with the application , PLEASE CONTINUE! If you don't know the application , PLEASE START! We know that is is not an easy task and we also know that it takes time. Therefore, WE REALLY DO APPRECIATE YOUR HELP VERY MUCH!! Please keep on playing and help us to gather more data! Please tell all your family and friends to support us! Please tell all your colleagues and fellow students to support us! 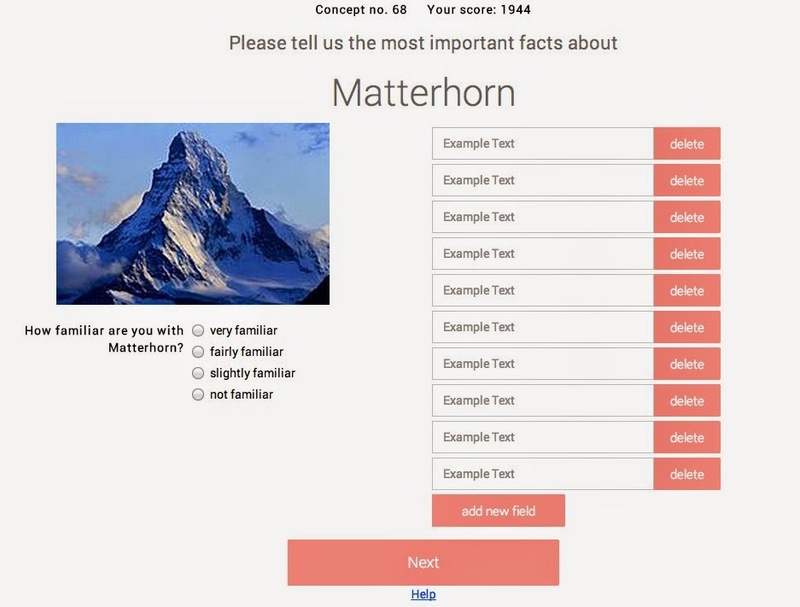 485 unique concepts are covered (out of 541). 295 times concepts were skipped (relevance in Step2 hasn't been changed for any of the facts). 0 concepts were done by 97 users. 1 concepts were done by 93 users. 2 concepts were done by 78 users. 3 concepts were done by 49 users. 4 concepts were done by 33 users. 5 concepts were done by 26 users. 6 concepts were done by 10 users. 7 concepts were done by 7 users. 8 concepts were done by 9 users. 9 concepts were done by 8 users. 10 concepts were done by 8 users. 11 concepts were done by 6 users. 12 concepts were done by 2 users. 13 concepts were done by 1 users. 14 concepts were done by 5 users. 15 concepts were done by 3 users. 16 concepts were done by 3 users. 17 concepts were done by 1 users. 18 concepts were done by 1 users. 19 concepts were done by 2 users. 20 concepts were done by 3 users. 21 concepts were done by 2 users. 23 concepts were done by 1 users. 24 concepts were done by 2 users. 25 concepts were done by 1 users. 26 concepts were done by 1 users. 31 concepts were done by 1 users. 36 concepts were done by 1 users. 40 concepts were done by 1 users. 42 concepts were done by 2 users. 56 concepts were done by 1 users. 58 concepts were done by 1 users. 60 concepts were done by 1 users. 64 concepts were done by 1 users. 68 concepts were done by 1 users. 70 concepts were done by 1 users. 88 concepts were done by 1 users. 201 concepts were done by 1 users. Sri Lanka : 1 users. Syrian Arab Republic : 2 users. Macedonia, The Former Yugoslav Republic of : 1 users. Western Sahara : 1 users. United States : 24 users. Taiwan, Republic of China : 2 users. Russian Federation : 12 users. Viet Nam : 1 users. South Africa : 2 users. United Kingdom : 15 users. Iran, Islamic Republic of : 2 users. New Zealand : 3 users. United Arab Emirates : 1 users. Syrian Arab Republic : 1 users. Czech Republic : 1 users. United States : 25 users. Saudi Arabia : 1 users. Taiwan, Republic of China : 1 users. Russian Federation : 6 users. Norfolk Island : 1 users. United Kingdom : 17 users. Iran, Islamic Republic of : 1 users. On AVERAGE there are 3.398 users per concept. On AVERAGE there are 5.002 answers per concept. As I already had announced in the previous post entitled "And Now for Something Completely Different..." this winter semester the Semantic Web Technologies lecture does not take place like an ordinary lecture. We follow the so-called Flipped Classroom Concept, i.e. the students "prepare" for the lecture (by watching the video recordings from the previous semesters), and we do the lecture in a more interactive way, driven by the needs of the students. So far the theory, but does it also hold in practice? OK, now we have reached lecture No. 6, i.e. almost already half of the entire course. Let me tell you what happened so far. Lecture preparation: I have to admit, I was a little bit afraid whether it would really work. But, the students always seem to be very well prepared and I'm really happy about that! Interaction: Well, I have learned that it is me, who has to take over the incentive. Now, the game works as follows: every week, I publish so-called syllabus questions, i.e. essential questions that the students should be able to answer after they have understood the lecture. We start the lecture now always by going through these syllabus questions, which give us sufficient material for interactivity (=discussion). When I simply ask "Do you have any questions about the content of the lecture? ", I rarely receive any answers. But, when I start to talk about some of the issues from the content, more and more people are contributing. Actually, I have asked the students whether they like the way of this lecture, and I have not received any negative answer so far. What I have learned so far is that for me as a lecturer the effort is almost quite the same for the flipped classroom as for a 'traditional lecture'. Moreover, you have to be very well prepared, because you always encourage the students to ask all kind of questions. The nice thing is the direct feedback that guides you to exactly those points where more explanation is needed. Personally, I like this way of the lecture very much. I never had any other lecture so far (well, besides lab courses or seminars) with so much feedback from the students. As always in October, lectures are starting again. 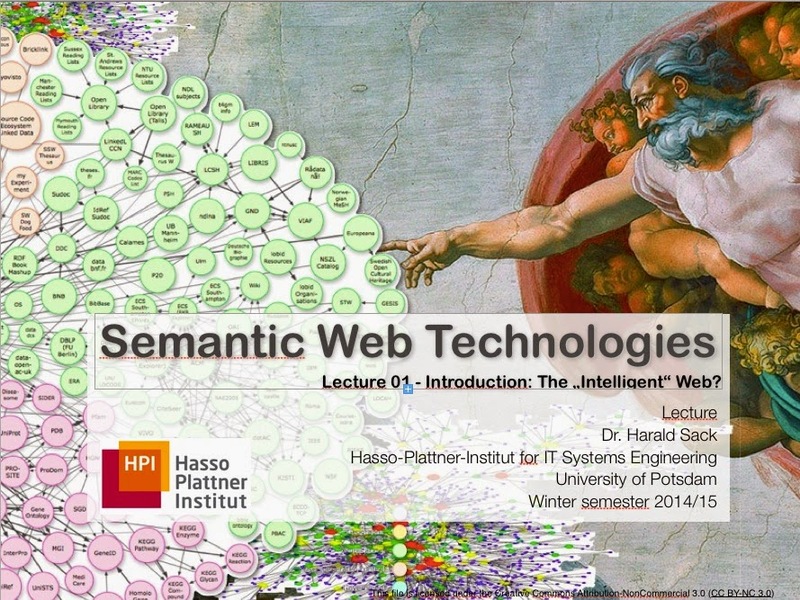 Like every year, I will give a lecture on Semantic Web Technologies. BTW, I have realized that I give now courses on Semantic Web for almost 10 years. It all started as a seminar at the Friedrich-Schiller Universität back in Jena and became a fully-fledged lecture here at the HPI in Potsdam. Like the lecture of last winter semester, almost all lectures have been recorded and are online available either at tele-Task or yovisto. Moreover, we have also prepared two MOOC courses Semantic Web Technologies in Spring 2013, and Knowledge Engineering with Semantic Web Technologies in Spring 2014, both very successful with thousand(s) of students. including all problems, errors, and complements that seem to be important. Thus, to follow the (live) lecture the students have to prepare accordingly. Of course this will only work with the active participation of the students. On the other hand, it will also be more challenging for the lecturer and the tutors, because we have to be very well prepared to deal with all kind of potential questions and problems. Of course we will work out problem solutions and answers always together with the students. And it will be also the students who will take over the lead - well of course under the lecturer's guidance. I'm very curious whether this concept will work out well with my lecture here at HPI. Please keep your fingers crossed and I will keep you posted. Again, here is an update about our currently gathered data about our fact ranking experiment. We started the original challenge about 5 weeks ago and now are able to present you some more intermediate results . Nevertheless, the challenge is still running. Therefore, please distribute, participate, advertise, and help us to generate a fully fledged ground truth for fact ranking . All data will be made publicly available for further research. To determine the importance of a fact is of utmost importance, if you want to properly understand the content of information. Usually, you have a rich variety of possible interpretations of information. To determine the proper interpretation, you are going to use the context, i.e. further available information. So, the question develops from "what is important?" to "what is important with regard of this specific context?". 446 unique concepts are covered (out of 541). 0 concepts were done by 79 users. 1 concepts were done by 79 users. 2 concepts were done by 68 users. 3 concepts were done by 41 users. 4 concepts were done by 25 users. 5 concepts were done by 22 users. 6 concepts were done by 8 users. 9 concepts were done by 6 users. 11 concepts were done by 4 users. 14 concepts were done by 4 users. 16 concepts were done by 2 users. 19 concepts were done by 1 users. 22 concepts were done by 1 users. 38 concepts were done by 2 users. 42 concepts were done by 1 users. 59 concepts were done by 1 users. 62 concepts were done by 1 users. United States : 21 users. Russian Federation : 9 users. United States : 23 users. Russian Federation : 2 users. South Africa : 1 users. New Zealand : 2 users. On AVERAGE there are 2.18 users per concept. On AVERAGE there are 4.71 answers per concept. 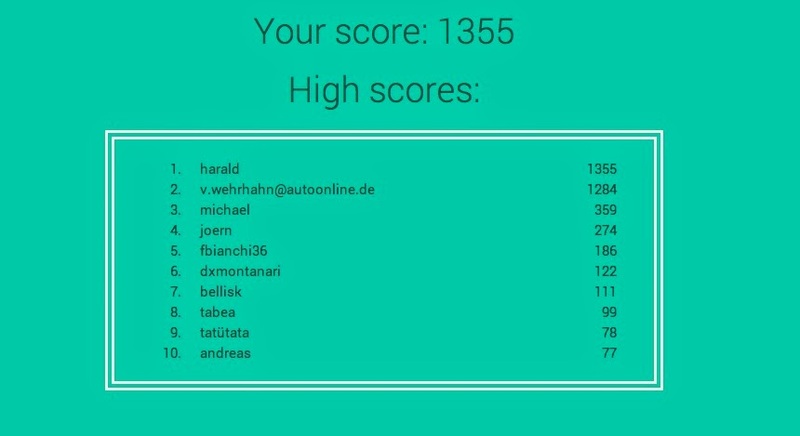 Hint: You might wonder about the impressive high scores on the top of the list? Well, actually points are given exponentially, i.e. the longer you play, the more points you will score per processed concept. In my last post, we invited you to take part in our research challenge, which was about creating a ground truth for fact ranking algorithms. To determine the importance of a fact is of utmost importance, if you want to properly understand the content of information. Usually, you have a rich variety of possible interpretations of information. To determine the proper interpretation, you are going to use the context, i.e. further available information. So, the question develops from "what is important?" to "what is important with regard of this specific context?". We started the original challenge about 3 weeks ago and now are able to present you first intermediate results . Nevertheless, the challenge is still running. Therefore, please distribute, participate, advertise, and help us to generate a fully fledged ground truth for fact ranking . All data will be made publicly available for further research. Overall 200 unique concepts are covered (out of 541). 0 concepts were done by 15 users. 1 concepts were done by 27 users. 2 concepts were done by 21 users. 3 concepts were done by 12 users. 4 concepts were done by 7 users. 5 concepts were done by 8 users. 6 concepts were done by 2 users. 7 concepts were done by 1 users. 8 concepts were done by 4 users. 9 concepts were done by 1 users. 10 concepts were done by 2 users. 11 concepts were done by 2 users. 14 concepts were done by 1 users. 16 concepts were done by 1 users. 20 concepts were done by 1 users. 53 concepts were done by 2 users. United States : 9 users. Russian Federation : 3 users. Italy : 6 users. India : 2 users. United Kingdom : 8 users. New Zealand : 1 users. On AVERAGE there are 1.295 users per concept. On AVERAGE there are 4.825 answers per concept. Please distribute, participate, advertise, and help us to generate a fully fledged ground truth for fact ranking. For us Western Europeans, war always seems to be far, far away in some other country (or some distant times in the past). Usually, we read about it in the newspapers or see the pictures in the media. But, we are not concerned directly. This also includes me as a researcher. Of course, we also have students in our institute who come from countries or regions in crisis. But, they are here and the crisis is there... elsewhere. As you might know, I recently finished my OpenHPI online course 'Knowledge Engineering with Semantic Web Technologies'. The course was rather popular with a total of 4,623 enrolled students from all over the world. 611 students took part in the final course exam and 450 students have finished the course successfully (yeah!!). Today, I have received email from a course participant in Gaza, Palestine. He wrote me about his appreciation for the OpenHPI team to offer courses like this and about the projects he carried out during his University studies. Unfortunately, as he wrote, due to the current situation in Gaza, infrastructure has been destroyed including power outages as well as network failure. Of course this makes it difficult next to impossible to continue the course (not to speak about all the other major problems for the people that arise from this conflict). I am deeply impressed that in a situation like this, people still continue their efforts to invest in their education...and their future. 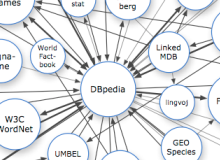 Recently, we have been working on the DBpedia / Wikipedia Page Link dataset. 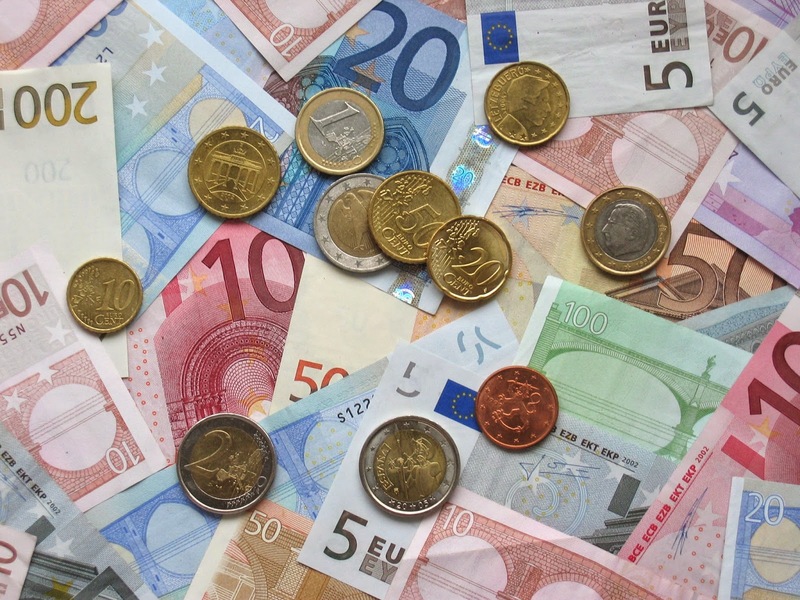 We have considered the English and the German language versions for this project. In the current DBpedia 3.9 page links English and German datasets 18 million and 6 million entities are represented respectively. But the original DBpedia only contains about 4 million and 1 million distinct entities for English and German versions. This significant difference is mainly due to the current DBpedia pagelinks dataset include redirect pages and pagelinks with resources that are not considered as entites (as e.g. thumbnails and other images). So we considered cleaning up DBpedia pagelinks dataset for the computation of statistical parameters (a.g. pagerank or HITS). For the Cleanup we have removed all unnecessary and redundant RDF-Triples from the pagelinks dataset, i.e all removing the redirect pages (Redirection pages are just URIs that automatically forward a user to another Wikipedia page, but do not represent entities) as well as RDF-Triples representing resources that do not have an own rdfs:label (as per DBpedia documentation every entity has an rdfs:label reference). One of the benefits of the cleaned up pagelink dataset is the faster computation of statistical graph measures (while not influencing the overall statistics, i.e. redirect pages usually don't have incoming links and theother removed resources (as e.g. images) don't have outgoing links). Based on this dataset we have computed PageRank, Hub and Authorities (HITS), PageInlink Counts and PageOutLink Counts. Please find the details of the datasets here on our research group's webpage . For Computation of the DBpedia graph statistics we have used JUNG — the Java Universal Network/Graph Framework. Please find the source code for PageRank and HITS computation here via GitHub . Finally, Germany has won the Soccer Worldcup 2014. Therefore, also our little statistics on soccer will come to an end with the post today. 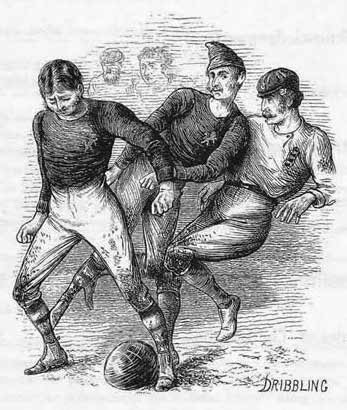 You might ask yourself what kind of data is left for soccer players in Wikipedia and DBpedia. Well, unfortunately only a little. But, we will try to make something out of it. Last time, we've ask for the number of team changes and the correlation to popularity vs. scored goals for soccer players. What is left, if we look at the available data? Possibly you will never have heard of Poland's Wojciech Łobodziński or Spain's Santiago Cañizares. Here another flaw in the data becomes visible. There is no such thing as the unique national team. We have "under 16", "under 17", "under 18", and so on... So you start your career already with 15 and after 8 years you would be 23 and possibly be in the "real" national team. Possibly this is because of people not only writing single year's into the Wikipedia infoboxes, but time spans and other things. In the list above are only the Top 20. Just remove the LIMIT from the SPARQL query and further down you will find more valid data. OK, let's come to our last problem related to football. Is there a correlation between the height of a player (simply because we have that data) and the number of achieved goals ? In the diagram to the left you see the soccer players height (x-axis) vs. the number of scored goals (y-axis). 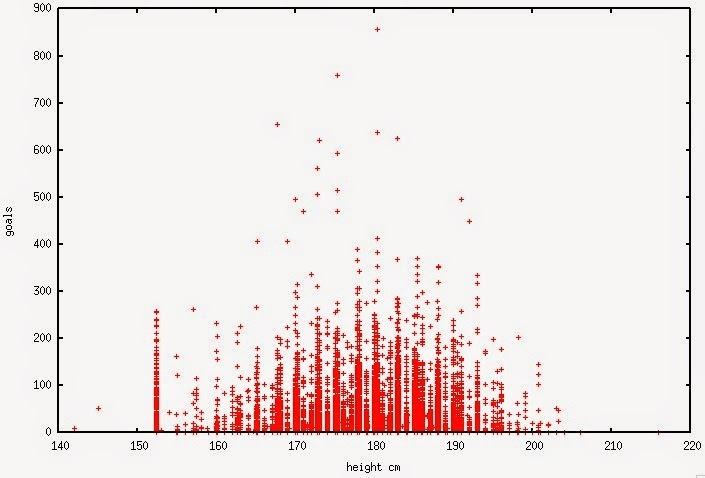 Interesting thing to notice is that the heights approximately show a Gaussian distribution, i.e most players have a "middle" height, on the extremes there are only a few. Well, there seems to be an exception. on the outer left you will notice a large fraction of players with a height of 1.52m with goal scores ranging among 0 to 300. This is extraordinary, because I have no idea what kind of group this is or if there is simply an error in the data again. What I noticed is that among this group there seems to be a larger fraction of female Asian soccer players. Maybe they are responsible for that large number of outliers, but this requires further investigation. Of course I limited the table to 30 rows. Interestingly, the average height of goalkeepers is larger than for midfielders or strikers. As expected, strikers on the average score more goals than defenders or goalkeepers. is there a correlation between soccer player height and scored goals? is there any correlation between player position, height, and scored goals? money...what about the football millionaires? How often do they change the team? Are you ready for more statistics on your favorite kind of sports? Well, data is fun, and obviously Big Data means Big Fun. There are lot's of interesting things to discover while exploring data, and wikipedia (i.e. dbpedia for the insiders) provides all the necessary means. Here, we have a table providing an overview about how many players (in wikipedia) have changed their team for how many times . Obviously, it seems to be some kind of Gaussian distribution with a peak between 2 and 6 team switches. OK, what about the players? Where are the top players listed in this table? Well, David Beckham switched team 11 times according to wikipedia, Cristiano Ronaldo 8 times, Thierry Henry 9 times. At least these numbers are above average which we had identified to be between 2 and 6. This seems to give proof to our original assumption. Looks interesting. Top goal scorer have 9 to 14 team switches. This is way above the average. Thus, the more goals you score, the more often you will have the chance of being transferred (and thus earn more money). Players that don't score goals will obviously not be transferred (that often). How many players have how many team changes overall?